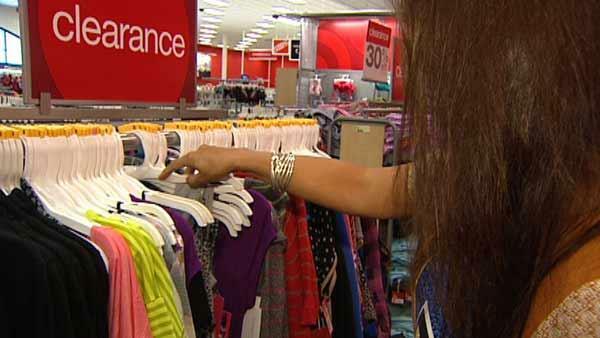 Frugal Fashionista Beth Newman says shopping the clearance rack is a great way to keep up with what is trendy without spending a lot of money. Get in on any and all customer rewards programs offered by many stores. In some cases, you can save at least 5 percent on your transactions. Don't be afraid to ask for an additional discount if there is a minor defect in the garment (ripped hem, missing button, etc.). Think outside the box when you find something that is defective or the wrong size. For example, add a broche to cover a stain, take the garment to get tailored, use a belt as a necklace, etc. Places, such as Goodwill, are great places to find upscale clothing items (cheaper than what you'll find even in a consignment store). Utilize the web & social media. Check stores' websites for 'daily deals' and new markdowns. Become their face book friend and follow them on Twitter. You'll be the first to know about sales and, often times; they will send exclusive offers to you. If you forgot a coupon, mention it to the cashier - often times they'll honor it even without you having it. Check all sales racks - sometimes 'your size' might be in the wrong location. Give yourself plenty of time. You might miss a great bargain if you're rushed or distracted.